The UVa Library is hosting a number of events as part of Endangered Data Week (April 17-21), a new, collaborative effort, coordinated across campuses, nonprofits, libraries, citizen science initiatives, and cultural heritage institutions, to shed light on public datasets that are in danger of being deleted, repressed, mishandled, or lost. Below is the current list of events we are hosting at UVa for Endangered Data Week. No reservations are required, and light refreshments will be provided, so please join us if you can! Introduction to Libra Data (Dataverse at UVa) – Monday, April 17th 11am-noon, in Brown Library, Room 133. Introduction to Git/Github – Tuesday, April 18th, noon-1:30pm, in Brown Library, Room 133. Introduction to DocNow – Tuesday, April 18th, 2pm-4pm, in Alderman Library, Room 421. Web Scraping with R – Wednesday, April 19th, 10:30am-noon, in Brown Library, Room 133. Preserving Artifact and Architecture with Cultural Heritage Informatics – Friday, April 21st, 10:30am-11:30am, in Clemons 3rd Floor VizLounge. Endangered Data Week webinar – Friday, April 21st, 1pm-2:30pm, in Brown Library, Room 133. Within the UVa Library, these events are being hosted by Research Data Services and the Scholars’ Lab. 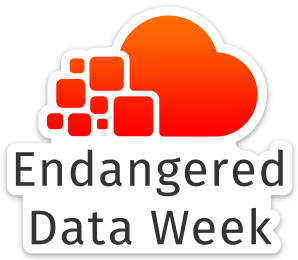 For more information about other Endangered Data Week events around the country and around the world, please visit the Endangered Data Week website. Libra Data, UVa’s instance of Dataverse is available for UVA researchers to publish and share data. Libra Data is for final, publishable products of research and can fulfill data sharing requirements from journals and/or funders. Benefits of using Libra Data include: Increased visibility and impact of your research data, Safe management of your data, Fulfillment of journal and grant mandates, and Valuable research time saved. Libra Data went live a year ago; you can read more about the benefits and the full Library announcement. Join us for the brief overview and demonstration session on Libra Data. Git is a program in the class of version control software. Proper use will help you to manage your development. Until recently the software has been a burden to operate but the development of Github.com has changed that. In this workshop we will explore the use of git through the github framework. We will work with the web interface and the desktop client. Please bring your laptops. The use of github requires a user account so please set one up prior to arrival at github.com. Join us for an introduction to DocNow, a tool and community developed around supporting the ethical collection, use, and preservation of social media content. Scholars’ Lab staff and fellows will be on hand to provide a brief introduction to the tool, a discussion of data collection, and a consideration of the complex, often fraught, stories that can be told through social media data. All skill levels are welcome and encouraged to attend. Refreshments will be served!. Sometimes data we find on the internet isn’t formatted for downloading and easy importing into our statistical program of choice. It’s simply displayed on a static web page as a table (if we’re lucky) or scattered about the page in various locations. To get this data requires “web scraping”. This means pulling out specific parts of a web page that we want to keep and wrangling into a structure suitable for further analysis. A recently-developed R package called rvest makes this process easier. In this workshop we’ll introduce how to use rvest for scraping web pages by way of several examples. We’ll also present a general strategy for web scraping and demonstrate some basic programming approaches to scraping multi-page web sites. Intrinsic to historic buildings and objects is the condition that they are subject to potential transfiguration and even loss over time. Cultural Heritage Informatics at the University Library seeks to collect data on our historic assets and to preserve data regarding their conditions over time. The University of Virginia has the rare privilege and honor of being located at a UNESCO World Heritage Site. We are surrounded by history at every level, from artifact to architecture. With equipment obtained by a far-sighted grant obtained in 2011, the University of Virginia Library has been collecting cultural heritage data of the buildings, monuments, sites and objects that surround us and that come to us via our faculty and students. Documentation tools including laser scanners, aerial drones and photogrammetric technologies, as well as industry-standard software are being utilized to collect and process what can be considered to be primary source data that is vital to our historic record as well as significant for scholarly use. In pursuit of our mission, we are researching methods of collecting, archiving and disseminating this data to our academic constituency. See the DLF webpage for more information about the webinar.